On previous pages I introduced Android Chinese features, and offered a quick survey of free Chinese input method editors (IMEs) for Android. Now that they've installed themselves, you may be wondering how to switch between input methods for English, Chinese and other languages, and where to find their settings. I've never owned a 3.x Honeycomb device, but here are instructions for 2.x through the most recent Android tablets and phones. 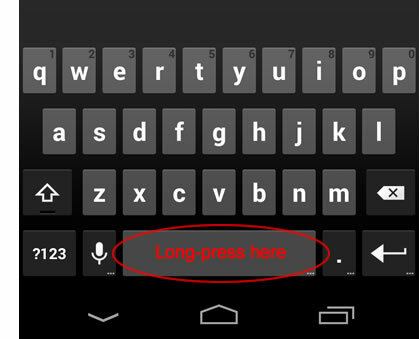 Android 5, 6, or 7: tap in any input field (like a Search box) to bring up a keyboard. Google keyboards: tap the language switch key (globe key) to switch to the next keyboard in your list, or press and hold the globe key (or the spacebar) to bring up the full list. 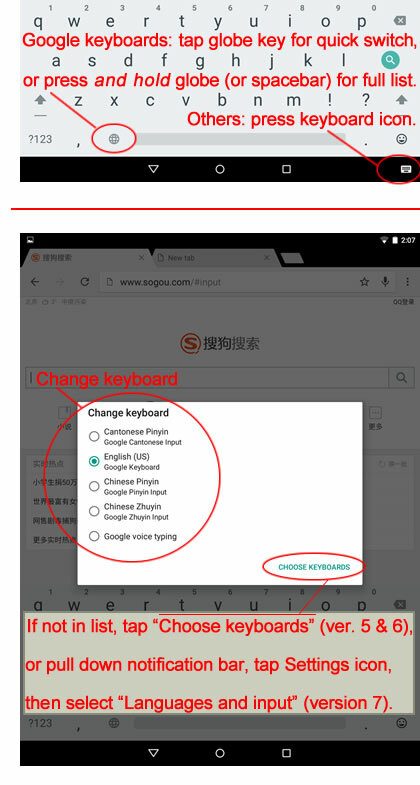 In Google Chinese keyboards, the language switch (globe) key only switches between English and Chinese within that keyboard, unless you go into system settings for that keyboard and under "Keyboard" turn on "Switch to other input methods". If an input method you've installed is not there: In Android 7, pull down the system notifications bar to reveal the Settings gear icon, tap that and go to "Languages and input". In Android 5 and 6, do the same or use the "Choose Keyboards" shortcut at the bottom of the keyboard selection pop-up, as shown here. To adjust your keyboard preferences go to "Languages and input" as described in the previous paragraph above. If you don't have any Chinese keyboards, or want to install more, see my introduction to Android Chinese support and my list of free Chinese keyboards for Android. If Chinese is not on your device at all, see the FAQ on adding Chinese to Android. Android 4: tap in the notification bar when the the keyboard icon appears. The keyboard icon only appears when your cursor is inside an input field. In the menu, select "Choose input method". Then select an input method from the list. You can also long-press on the globe key next to the spacebar to get the "Choose input method" list. That globe key is optional for the main Google keyboard, via Settings > Language and input (or whatever your manufacturer calls that) > Multiliingual Options. You can also do a normal quick press on that same globe key to move to the next active keyboard, but until Android 5 few other keyboards worked the same way. For example, once in the Google Pinyin keyboard you'd need to long-press to bring up the whole list again. If an input method you've installed is not there, select "Set up input methods" at the bottom (or leave the app you're in and open "Settings", then look for "Language and input" or whatever that item is called on your device). Make sure each input method you want to use is selected with a check mark. If you don't have any Chinese input methods, see my introduction to Android Chinese support. If Chinese is not on your device at all, see my FAQ on adding Chinese to Android. But assuming you do have Chinese language support, all you may need is more input methods. 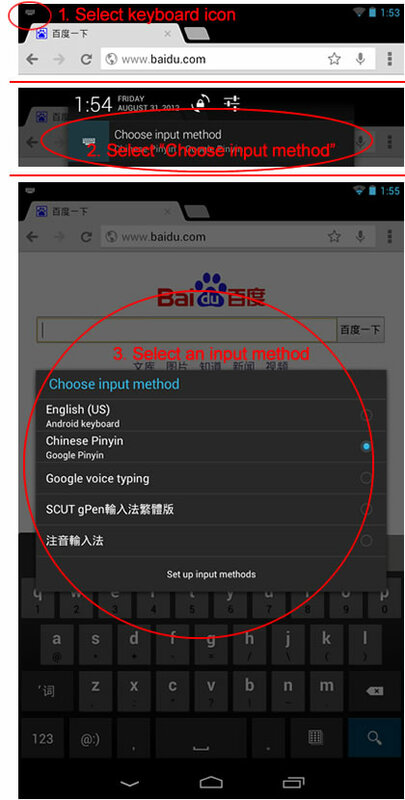 There are many free Chinese IMEs for Android, including Google Pinyin Input, Google Zhuyin Input, and Google Cantonese Input, as well as input methods from Baidu, Sogou, QQ, SCUT, and others. It is also possible to quickly bring up the input method menu via a keyboard shortcut, if the developer of your keyboard included this feature. The English keyboard in Android 4.x has a simple shortcut hidden away: Long-press on the spacebar, and the "Choose input method: menu will appear. Find your choice in the menu (scrolling up or down as needed), tap once on the input method you want, and the other keyboard will appear. 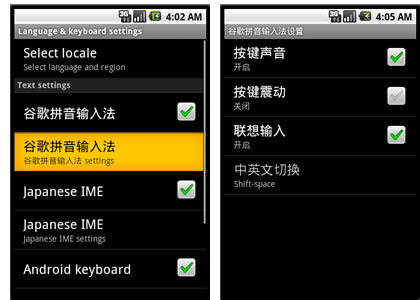 The Google Pinyin Input keyboard for Android did not include a shortcut until an update released on September 5, 2013. 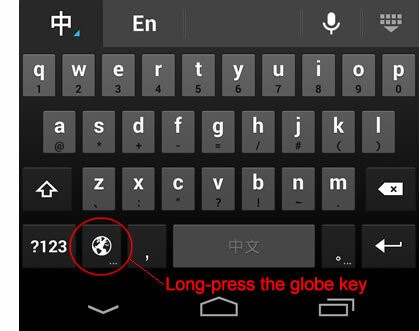 On this keyboard, you need to long-press the button with the globe icon, which previously only switched between Chinese and English within Google Pinyin Input. English typing with this keyboard is not bad, though. Note that you may need to scroll up in the menu to find the English keyboard again. 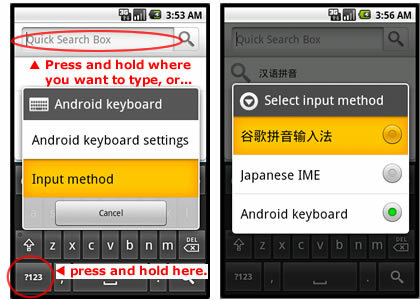 Android 2: press in the input box where you want to type. A menu will pop up, allowing you to select "Input method". If you can't make the input method menu come up, or if an input method you've installed does not appear, press the Menu soft key and go to "Settings" > "Language & keyboard" (or whatever that item is called on your device). Make sure each input method you want to use is selected with a check mark. More info is below. To add Chinese input methods, see my introduction to Android Chinese support. If Chinese language support entirely missing, see my FAQ on adding Chinese to Android. You'll also find many optional settings for your input methods. For example, if you press "Google Pinyin settings" you'll find several more options than shown here, including "Stroke input" and "Traditional Chinese". You can also tell it to stop making sounds when you type, not to predict phrase associations for you, and so on.